Char tastes rather like salmon but is a smaller fish making it a better size for two. There are both wild and farm-raised Char. Wild fish are preferable from a nutritional point of view, as, in theory, they are able to obtain their normal diets rather than some sort of feed which might not contain all the nutrients the fish require. Capers are the bud of a flowing shrub, which is native to eastern Asia but widespread in the Mediterranean region. Capers are used as a condiment, either pickled in vinegar or preserved in brine. Skin the Arctic Char and remove any dark blood line down the center of the fillet. Remove any pin bones. Coarsely dice the Arctic Char using a very sharp, clean knife, and cutting board. Place in a mixing bowl and refrigerate. Add the lime rind and juice, chopped chives, sea salt, pepper, cayenne, and olive oil to the diced Arctic Char. Toss well, taste, adjust seasonings, cover, and refrigerate. 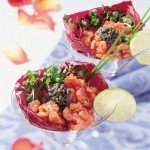 To Serve: Place a radicchio leaf and a small bunch of salad in the bottom and up one side of each martini glass. Divide the seasoned tartare between the two glasses over the radicchio leaves. 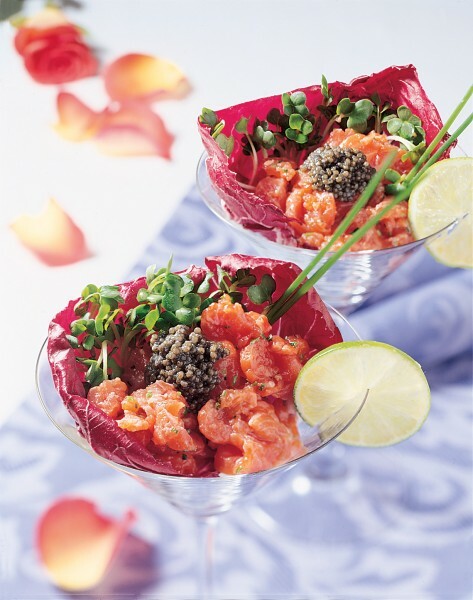 Garnish each tartare with 4-5 capers, a chive straw, and 1/2 teaspoon caviar. Attach a lime section to the rim of each of the glasses. Serve with toasted slices of country bread. Variation: For a spicy tartare, add 1/2 teaspoon finely chopped Jalapeño pepper and omit the caviar. Substitute salmon for the Arctic Char.